Hello there! My name is Foley, welcome to my website! 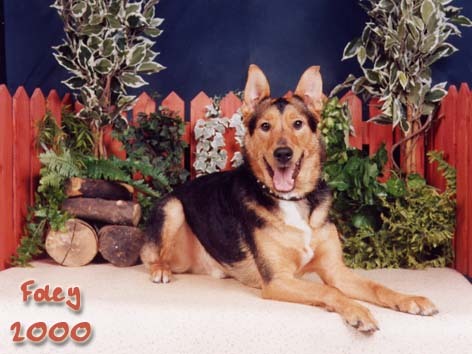 I am 5 years old and am a German Shephard mix...mixed with what we don't know yet. But whatever my parents were, they sure did make a handsome son!! My Momma & Daddy rescued me from an RSPCA shelter on April 1, 2000 and boy am I glad they did!! Although I was happy that I had a home, I missed having a family and people to play with. For a good while after coming home with Momma & Daddy, I wasn't quite sure what toys were nor what to do with them! But now-a-days you can't get me to stop playing!! In June of 2001 Momma & Daddy came home with a new little brother for me, Fala. It took me a while to get used to having this little fur ball around, but now that he's bigger and more grown up, I enjoy playing with him.